Uflex Limited made an astounding impact at the Propak China exhibition that was held during 11-13 July 2018 in Shanghai New International Expo Center (SNIEC), Shanghai, China. 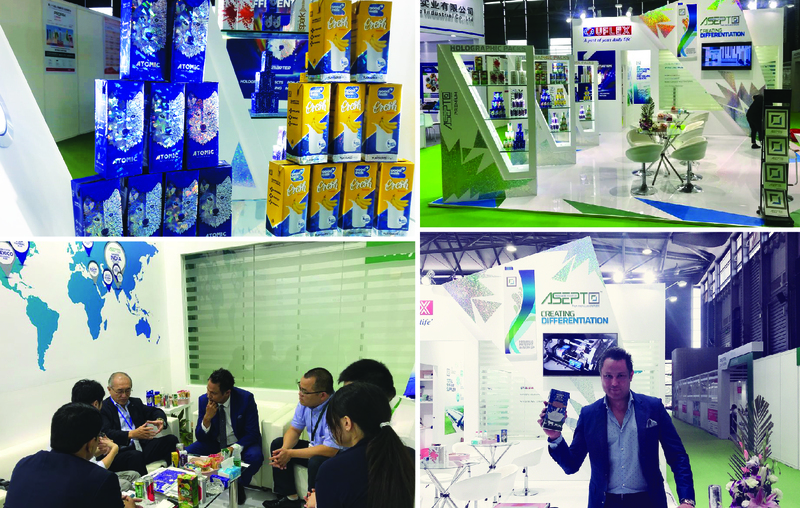 The company showcased its ASEPTO brand – an aseptic liquid packaging brand crafted by Uflex – as an exhibit, which won high appreciation for its unprecedented feature, i.e., holographic packs. In exhibiting so, Uflex successfully tested the interest level of global beverage manufacturers for holographic applications in aseptic liquid packaging. The talking point feature not only made Uflex the first Indian company to showcase the holographic packs in China, but also allowed global beverage manufacturers industry take note of India’s superior manufacturing ability. The ASEPTO holographic feature mesmerized the attendees at the exhibition who took great interest for having identified a unique way to promote their products/brands. The eye-catching holographic pack was extremely appreciated for the fact that it holds the potential to escalate a brand’s sales growth based on the differentiation it would create over the counter at retail stores and hypermarkets. Holography in packaging is a novel concept, which gives an edge to an existing line of products/brands and, simultaneously, helps companies launch new line of products/brands to upscale their product portfolio. “Holography is a new concept in packaging, which will be enjoyed by the brand owners. I am extremely proud to say that Uflex presents, through ASEPTO, quality packaging solution to the industry, which has been recognized globally with all the international certifications to its credit, such as BRC, FDA, Halal and FSC certifications. I firmly believe that our holography packs will help us progress business relations in foreign markets since we are delivering on quality innovation promise and standards that brand owners are seeking out, and our product is on a par with global standards,” Sharma elaborated. Propak China showcased Uflex and ASEPTO’s core strength of innovation courtesy the holography application in aseptic packaging to the world. A total of 16 countries visited the exhibition, with event participation from SSE Asia – 20%, China – 60%, the Middle East – 10%, Africa – 5% and Europe – 5%. The overall footfall in the Uflex booth was extremely impressive and generated several business inquiries.